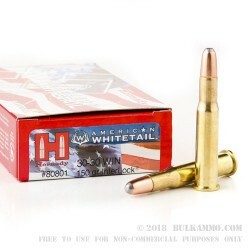 Make sure you’re prepared for this year’s monster buck with Hornady American Whitetail .30-30 ammunition. Hornady’s INTERLOCK bullet technology has revolutionized hunting for whitetail deer. This technology features exposed lead-tipped bullets, allowing for controlled expansion and powerful performance with devastating results. These feature the exclusive INTERLOCK ring, which is a raised ring inside the jacket that keeps the core and jacket together during expansion. This means more weight retention and energy upon impact, making for an incredibly effective deer stopper. 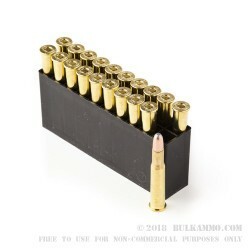 These .30-30 rounds come equipped with a 150-grain round nose projectile, in boxer-primed, noncorrosive reloadable brass cases. 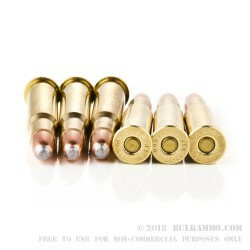 These rounds are great for deer, or even larger game up to 300 lbs and come 20 cartridges per a box. At the forefront of ammunition technology, Hornady has become a world leader in ammunition production. 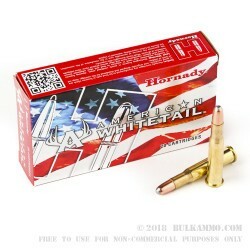 Beginning as a reloading supply company, Hornady has become an American ammunition legend, producing some of the most reliable and accurate ammunition available. Shoots clean, consistent performance, no loading issues. Rifle loads, chambers and fires consistently with this ammo. No criticisms. 150 grain is a good all around load, we use for Deer, Hogs, and nuisance animals.